Title: 08/13/1993 - MSDS requirements for drugs. This is in response to your April 26 letter addressed to Congressman Thomas Ewing concerning the Occupational Safety and Health Administration's (OSHA) Hazard Communication Standard (HCS), 29 CFR 1910.1200. Your letter specifically questioned the requirements for Material Safety Data Sheets (MSDS) for drugs. Drugs regulated by the U.S. Food and Drug Administration (FDA) are covered by the HCS. However, section (b)(6)(viii) of the HCS exempts FDA drugs when in solid final form, such as tablets or pills, for direct administration to the patient. The intent of the HCS is to provide information to employees about the hazards of the chemicals they may be exposed to while working. In the health care industry this intent is met when drug manufacturers and health care employers work cooperatively to transmit hazard information to all affected employees facing potential downstream exposure to hazardous drugs. OSHA does not maintain a list of chemicals covered under the HCS. The rule requires chemical manufacturers and importers to evaluate the information available regarding the hazards of any chemical they produce or import and to make that information available to their customers by means of appropriate labels and material safety data sheets (MSDS). It has been estimated that under this approach the HCS applies to some 600,000 hazardous chemical products in use in American workplaces. As a user of chemicals you may rely on the evaluations performed by the suppliers of the chemicals you use. 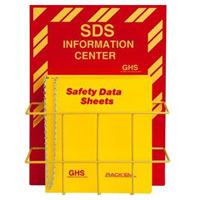 If you receive a label or MSDS from your suppliers that indicates the chemical being used is hazardous, then you must include it in your hazard communication program. OSHA believes that the HCS is a performance oriented, common sense standard. The HCS does not apply to chemicals that do not present a health or physical hazard. Conversely, any substance that presents a potential health or physical hazard to which an employee may be exposed must be included in an employer's hazard communication program. If the chemical is not available for exposure either under normal conditions of use or in a foreseeable emergency, then the chemical does not need to be included in your Hazard Communication Program. Section (b)(2) of the standard states that "This section applies to any chemical which is known to be present in the workplace in such a manner that employees may be exposed under normal conditions of use or in a foreseeable emergency." Exposure includes any route of entry (inhalation, ingestion, skin contact, or absorption) and includes potential (accidental or possible) exposure. In response to your concerns about the cost of complying with the HCS OSHA is required to perform a feasibility analysis to determine whether a standard can be implemented, both technologically and economically. In the preamble to the final rule on Hazard Communication (FR Vol. 52 No. 163, page 31855) the agency concluded "... that the economic feasibility of extending the current HCS to the non-manufacturing sector (includes health care industry) is supported by the record." OSHA recognizes the program start up and maintenance costs to the non-manufacturing sector but finds they can feasibly provide employees with chemical hazard information as required by the HCS. Included for your reference is a pamphlet on the HCS. We hope this information is useful to you. We received this letter from one of our constituents practicing in a rural area of Illinois. He is concerned that the OSHA MSDS's may be unnecessarily burdening to doctors in particular areas such as his. In response to his letter, I spoke with Jackie on Friday, June 11th to gather some information about the requirements. She suggested that due to the technical nature of the constituent's questions, we should simply refer our letter to your office to be answered. Thank you for handling this matter. I am confident that due to your expertise, you will be able to respond much more effectively than we could. I am writing this letter in regards to the OSHA requirement for physicians' offices to maintain a Material Safety Data Sheet on harmful agents administered in their offices. I feel OSHA has gone overboard on this requirement as I have read the medications that they have listed as needing a Materials Data Sheet. I specifically will address the data sheet on the use of SoluMedrol, and, under Section 6, regarding Health Hazard, the very opening statement says that there are no adverse effects of overexposure anticipated during normal handling of vials of the finished product. If one continues to read through the remainder of the paragraph, they will see that the only way exposure can occur to a significant side effect is if the personnel are actively injecting the medication into their own bodies. In the medical fields of nursing and physician training, all of us have been told not to inject medicines into our own bodies, unless directed so under a doctor's guidance. This is just another example of the ridiculous bureaucratic nature of OSHA and their attempts to inflame the price of medication and price of health delivery within the United States. This is not meant to undermine the importance of such a material safety data sheet as I do feel there are several medicines being administered within the United States that would be significant upon even minor exposure, but there are several dozen now listed, which on routine exposure have no significant consequence. The time and effort that I will be required to put into keeping this manual current, based on these OSHA regulations is very significant, and I will have to readjust my office fees based on the amount of time I am required to spend keeping my office within OSHA standards. I'm sure that all of you are aware of the healthcare issues that have been presented in the last several months regarding the enormous amount of time and cost that we are now putting toward paperwork and this is simply another example of that debate which has been raging in the United States over the last 13 months. If you are aware of another group or individual that I should be sending this letter to who can see to it that something is done about this ridiculous paper overload that we are now undergoing, I would be glad to send this letter to them as well. I would hope that you could send me some comment on your opinions as regard to this letter. SafetyEmporium.com carries both serious and humorous signs. Jay D. Willey, M. D.